The Standard Units are spacious with a new tiled entrance, kitchenette and modern bathrooms with walk-in shower. The light breakfast ingredients which are included in the tariff is placed in the cupboards and fridge. A microwave, toaster, electric jug, cutlery, crockery and glasses are in each nit. The units all look out to the lawns and gardens, with parking beside each unit. A selection of Standard units have inter - connecting doors, making excellent family units. The Standard Units are spacious with a new tiled entrance, kitchenette and modern bathrooms with walk-in shower. The light breakfast ingredients which are included in the tariff is placed in the cupboards and fridge. A microwave, toaster, electric jug, cutlery, crockery and glasses are in each nit. The units all look out to the lawns and gardens, with parking beside each unit. A selection of Standard units have inter - connecting doors, making excellent family units. Rates for 1 person. The 3 Luxury Units are large light units with a dressing room and luggage rack beside the bath room. The units have a queen size bed, and sofa bed, table and chairs, a desk, air conditioning, kitchenette with the light breakfast ingredients, electric jug, toaster, cutlery, china and glasses. The units look out to the spacious lawns and and gardens, with parking near the entrance door. The Spa Suites, are warm large units with a separate dressing room, luggage area and a spa bath. The kitchenette near the entrance contains the light breakfast ingredients, cutlery, crockery and glass ware. The units all have a fridge, microwave, electric jug and toaster. The Queen size bed has woolen blankets and a bedspread with white cotton pressed sheets. A desk , Television, dining table and chairs plus and sofa lounge make up the furniture in each unit. The King suite offers a king size bed central bathroom and a king single bed in a separate room. The bathroom has a spa bath, separate shower and vanity. The high timber ceilings make this unit very spacious. The kitchenette contains the light breakfast ingredients, electric jug, toaster, microwave, cutlery, crockery and glass ware. 2 Televisions, desk space and table and chairs and sofa lounge make up the furniture. Coonawarra Units is located in the heart of the Coonawarra Vineyards, next to Chardonnay Lodge, Restaurant, wine sales and function centre. Guests receive light breakfast provisions in the unit on arrival and have access to free WiFi and parking. It is 8 km from Penola restaurants and shops. Coonawarra Units is the most significant accommodation in the heart of Coonawarra and is uniquely located amoungst the famous vineyards. Laid out in Row Cottage style around extensive lawns and gardens, the units offer a range of accommodation options and rates with all being on ground floor. 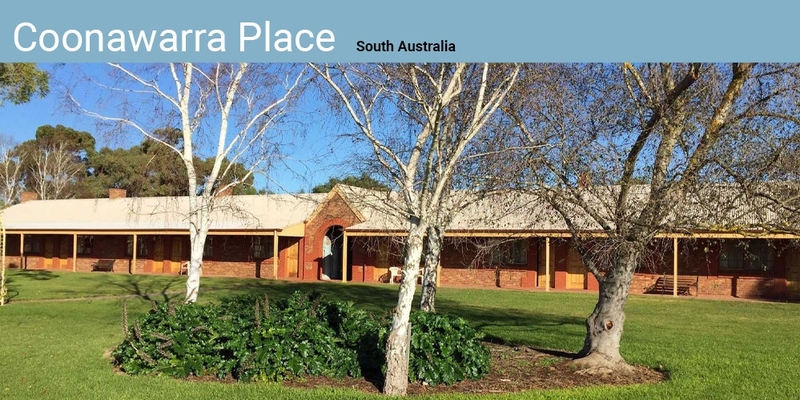 Located adjacent to, and formally part of Chardonnay Lodge, the units have been the Coonawarra accommodation choice for world wine enthusiasts for many years. The units are often enjoyed by families and as a meeting place for friends and special interest group. Persons on commercial business are also catered for. While retaining their Australian architecture, the units have had significant internal upgrades to satisfy customer expectations in more recent times. Constantly complimented for their exceptional space, high ceilings, excellent kitchenettes and bathrooms, their rates include substantial light breakfast provisions, Free WiFi and ample parking at the door. The inner door of each unit opens onto the central "village green" of lawns and gardens which features a central gazebo with BBQ dining facilities. The air-conditioned units have a kitchenette with a fridge, a microwave and an electric kettle. Each is also equipped with ironing equipment, a flat-screen TV and a modern bathroom. Coonawarra Units is a 5-minute walk from Coonawarra Jack Winery and a 4-minute drive from Wynns Coonawarra Estate & Cellar Door. It is a 46-minute drive from Mount Gambier. The Units are near Zema Estate Winery and walking distance to 6 other wine sales. Great stay. Perfect location close to wineries and not far from Penola township. Room was clean and comfortable and the breakfast provisions were a bonus! Fantastic facility surrounding by all the wineries. Great spacious, clean rooms. Provisions left for breakfast which was great. We had dinner in the Chardonnay Lodge next door which was amazing. On arrival keys were ready and the staff were very helpful and friendly. it was a great stopover, happy with everything thanks! Thank you for staying, hopefully you will need a stop over again. Reception Hours : Private check-ins. Please provide a mobile phone number when booking. After Hours : Please provide a mobile phone number when booking. Our contact number can be found on the booking confirmation email. Coonawarra Units is a 5-minute walk from Zema and DiGiorgio Wine Sales and a 4-minute drive from Wynns Coonawarra Estate & Cellar Door. It is a 46-minute drive from Mount Gambier. © Copyright – Coonawarra Units All Rights Reserved.